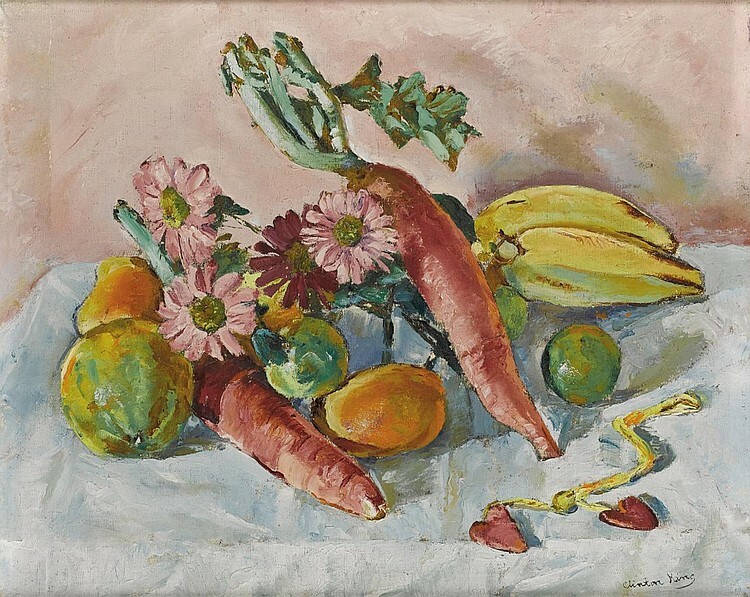 Texas-born artist Clinton Blair King (1901-1979) lived in Chapala for about three years in the early 1930s. King was born in Fort Worth in 1901 and studied at the Virginia Military Institute, the University of Texas and Princeton University. He also attended the Grand Central School of Art, the National Academy of Design in New York and Broadmoor Art Academy. His art teachers included Sallie Blythe Mummert, Charles Webster Hawthorne, Robert Reid and Randall Davey. Over his 40-year artistic career, King mastered several distinct styles including Realism, Impressionism and Abstract Expressionism at different times. He was also a talented pianist. King first gained recognition in the art work when his oil portrait of “Spud” Johnson (who had just returned from visiting Chapala with D. H. Lawrence and Witter Bynner) was exhibited at the Annual Exhibition of the Society of Independent Artists in New York (1926-27); the portrait was praised by critics. After moving to Mexico, King developed his talent for portraiture and his early modernist portraits have been favorably compared by critics to those by Diego Rivera. The great American poet Witter Bynner, a long time resident of Chapala, knew King and his wife well and his double sonnet about them, entitled “Expatriates”, was published in Guest Book (1935), his collection of masterful sonnets about his friends and acquaintances. Lear was especially impressed by King’s portraits which included a “psychological study” of Carol Navarro, a classical portrait of Maria Pacheco (widow of hotelier Ignacio Arzapalo) and several portraits of the “native inhabitants of Chapala.” More abstract works included some colorful “regional cubists” of Chapala. 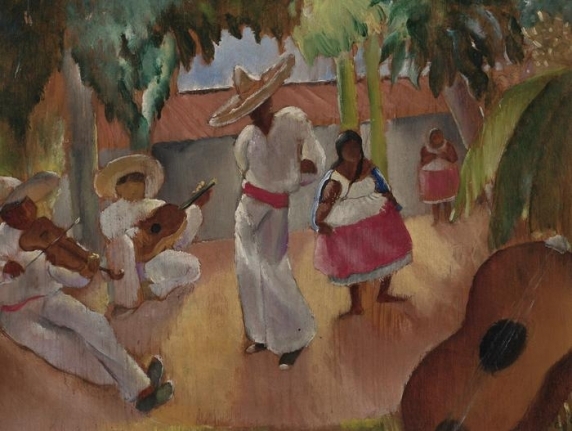 King also exhibited several “vernacular, colorful watercolors.” His oil paintings almost certainly included one entitled “Roofs of Chapala,” a photograph of which was later chosen for inclusion in a 1939 issue of Mexican Life, Mexico’s Monthly Review. In summer 1933, the Kings left Mexico for New York, before settling in Santa Fe, New Mexico. King remained in New Mexico and was later introduced to Narcissa Swift (1911-1998), heiress to the eponymous meat-packing company, by mutual friends, Georgia O’Keeffe and Mabel Dodge Luhan. In 1941, Swift became King’s second wife. They divided their time between Chicago, Paris and Mexico (where they owned a home in Taxco, Guerrero). O’Keeffe’s painting “Narcissa’s Last Orchid” (1941) was a tribute to Swift. (O’Keeffe has her own vicarious connection to Lake Chapala via sculptor Mym Tuma, who had a studio in San Pedro Tesistan, near Jocotepec, from 1968 to 1973)). Clinton King and Narcissa Swift King – self portrait. 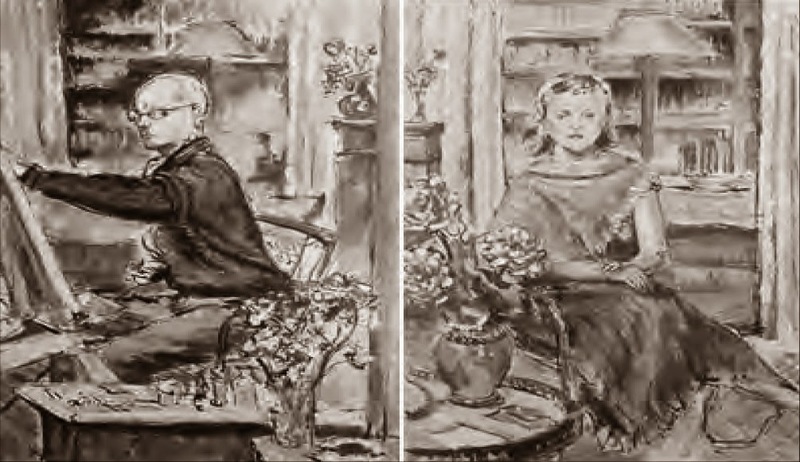 In 1950, King and his wife joined Witter Bynner and his partner Bob Hunt on a six month trip to Europe and North Africa, visiting (among others) Thornton Wilder and James Baldwin in Paris, and George Santayana and Sybille Bedford (author of a travelogue-novel about Lake Chapala) in Rome. King was one of the most prominent of all early Texas artists. His work was widely exhibited in Europe and North America. According to one biography, his solo shows included Guadalajara Regional Museum (1933); Galeria Excelsior in Mexico City (1933); Witte Memorial Museum, San Antonio (1934 and 1955); Passadoit Gallery, New York (1935); Fort Worth Artists Guild (1937); North Texas State Teachers College in Denton (1937); Elisabet Ney Museum in Austin (1938); Dallas Museum of Fine Arts (1939); Alice Roullier Art Galleries, Chicago (1941); Corpus Christi Memorial Museum (1947); Feragil Art Galleries, New York (1949, 1950); Elizabeth Nelson Galleries, Chicago (1951, 1953); Fairweather-Hardin Gallery, Chicago (1958); William Findlay Gallery, Chicago (1964, 1965); and Chicago Public Library (1966) as well as seven one-person shows elsewhere (London, Paris, Stockholm, Lisbon and Casablanca). The 1937 exhibition at the North Texas Teachers College was a selection of watercolors and drawings, mostly produced in Mexico. It included several portrait studies, for which King was particularly well known, and a number of landscapes painted in Taxco and Cuernavaca. Among the many public collections that hold paintings by King are those of the the Biblioteque Nationale in Paris; the Victoria and Albert Museum, London; the Library of Congress; the National Collection of Fine Art, Washington D.C.; the New York Public Library; the Museum of Fine Arts, Santa Fe; the Philadelphia Museum of Fine Art; the Modern Art Museum in Fort Worth; California Palace of the Legion of Honor, San Francisco; the Indianapolis Museum of Art; and Baltimore Museum of Art. King died while on vacation in Cuernavaca in 1979. In the mid-1980s, two retrospective exhibitions were held in Santa Fe: at the Armory for the Arts (1985) and Fogelson Library Center, College of Santa Fe (1986). Witter Bynner. 1935. Guest Book. New York: Alfred A. Knopf. Peter Falk, editor. Who Was Who in American Art. Sound View Press, 1985. El Informador, 11 May 1930, 8; 18 March 1933, 5; 19 March 1933, 4. John and Deborah Powers, Editors. Texas Painters, Sculptors & Graphic Artists: A Biographical Dictionary of Artists in Texas before 1942. Woodmont Books, 2000. Lady Twysden, Ernest Hemingway’s Chapala connection Art Mystery – Who took this evocative 1935 photo of Lake Chapala?